One of the most frustrating things I see all too often are suspicion-less check points. They come with a few different marketing angles such as “safety check point,” “DWI checkpoint,” and “Truck inspection.” These are blatantly unconstitutional and there is no intelligent reasoning that I’ve heard on how we as American citizens allow them. We all sing that America is the land of the free yet we comply with unconstitutional suspicion-less check points, please someone explain how this represents freedom. The 4th amendment states “The right of the people to be secure in their persons, houses, papers, and effects, against unreasonable searches and seizures, shall not be violated, and no warrants shall issue, but upon probable cause, supported by oath or affirmation, and particularly describing the place to be searched, and the persons or things to be seized.” We have the right to be secure in our persons, houses, papers and effects. Officers will say NYS law allows for it, but remember, any law that is unconstitutional is considered null and void from it’s inception, not from the time it is found to be unconstitutional. Police are not allowed to stop your vehicle simply for driving down a certain road. This is obviously discrimination and no different than an officer stopping a black man simply based on the color of his skin. A checkpoint stops everyone in a vehicle, simply based on the fact they are driving a vehicle and on a certain road. If you did not drive down this road you would not be stopped, therefore they are discriminating against all people who drive on that road. This is a violation of an explicitly protected right, not some granted “privilege”. How then do we allow something like safety check points which so clearly violate our rights as people? Many talk about the Constitution yet few will actually do anything to protect it. It’s time we all start taking these things more seriously and acting on our rhetoric. I always use checkpoints as a way to inform police that they are violating the oath they took, and are willing participants in the government attempting to strip rights away from the people. I will not comply with certain demands officers make, as they have no right to make them. Sure this has caused me to spend a little extra time as they hassle me, try to intimidate me or take me out of the vehicle, but in the end I have never received a ticket nor been arrested for standing up and asserting these basic rights. I wish more people would start to refuse to comply at checkpoints, because those who do comply are also willing participants in the slippery slope of a police state. People have told me that I’m just trying to cause trouble and that I should simply talk to them quickly and move along. “Why waste your time?”, they say. And my personal favorite, “Matt if you’re not doing anything wrong what do you care?”. These statements honestly make me sick to my stomach. Why do I care? I care about my son’s future living in America and I care about the birthrights of my fellow citizens. It is my duty as an American to refuse to comply and to attempt to educate officers when they are violating their own oath. Imagine if our Founding Fathers were just great speakers and didn’t actually believe or follow through with anything they spoke about. Do you think we would have ever become the greatest nation in history with that kind of attitude? 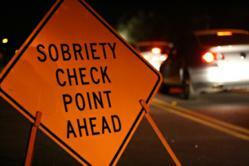 Recently at a suspicion-less, sobriety checkpoint in Perth, New York I was removed from the vehicle. I was removed for saying “you have no right to stop our vehicle and you are violating the Constitution.” Now this NYS Trooper was an angry person, and started screaming at me. I, confident in my rights, never needed to raise my voice as when you are speaking facts you don’t need to use intimidation. She demanded I show her identification and I refused as I was not the driver of the vehicle and last I knew Perth, NY was not Nazi Germany. In America, you are not required to carry papers to simply travel freely. I was removed from the vehicle and soon another two officers joined in the attempted intimidation. They demanded I comply with a whole series of demands and questioning. Instead of answering the questions the way they were pushing me, I answered with passages from the Constitution. I in turn questioned them about the oath they swore, and specifically if they thought a checkpoint violates the 4th amendment. The female trooper who originally removed me from the vehicle kept demanding that I show identification, yet I refused. I gave her my name and date of birth, which is all that is required of a non-driver in NYS. She was upset and continually screaming, but when I brought up the fact that I had identified myself, one of the other officers told her I was correct. In fact he said “one thing for sure is you have studied your rights.” Soon after, I was allowed back into the vehicle and we were released from detainment without any form of ticket or citation. Honestly, I would love to just drive to my destination. However, as an American who really does care about freedom, I at times must set aside my own convenience. I consider it time well spent time and the risk of confrontation worth it in an attempt to help save our rights. If more people would stand up and believe in the Constitution it would not take long for us to abolish these unconstitutional suspicion-less check points. I encourage everyone who has taken the time to read this pledge to make a pledge. Pledge to never willingly allow your natural rights to be violated. If you have any questions, concerns, or need any help with what to read and study so that you can be informed when you challenge these checkpoints, feel free to contact me. For more on how to deal with police, visit Flex Your Rights a very informative website. They have a wide range of topics and videos that can help you start to know your rights and why they are important. Also you can always contact your local American Civil Liberties Union and ask them questions in regards to traffic stops. Remember, all traffic checkpoints are unconstitutional and that is just a MATTer of fact. There are 11 states which do not allow this suspicion-less unconstitutional check points. (Alaska, Idaho, Iowa, Michigan, Minnesota, Oregon, Rhode Island, Texas, Washington, Wisconsin, and Wyoming.) Will you help me make New York State the 12th?